Signs play an essential role in telling prospects about your business and its services. Your sign is crucial in getting prospects to notice your business, or if they are looking for you, to know they have found you. Depending on your type of business, signs also serve to help with many other informational and promotional needs. 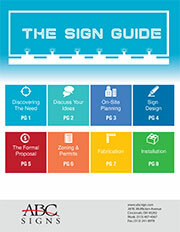 Browse the following industry sections to see how signs can be helpful in a variety of ways. Once you are ready to get started give us a call. The experts at the ABC Signs sign company will assist you in developing the perfect sign for your business! Communicate your message effectively to your Greater Cincinnati and Northern Kentucky audience with ABC Signs. Please call (513) 407-4367 or email us today! Looking for an additional resource? Learn How to Calculate the Value of Your Business Sign.